This walkthrough will teach you how to build a very simple mission in a couple of minutes. First, launch FRED2_Open (if you haven't already). You'll find yourself looking at a screen much like this one. 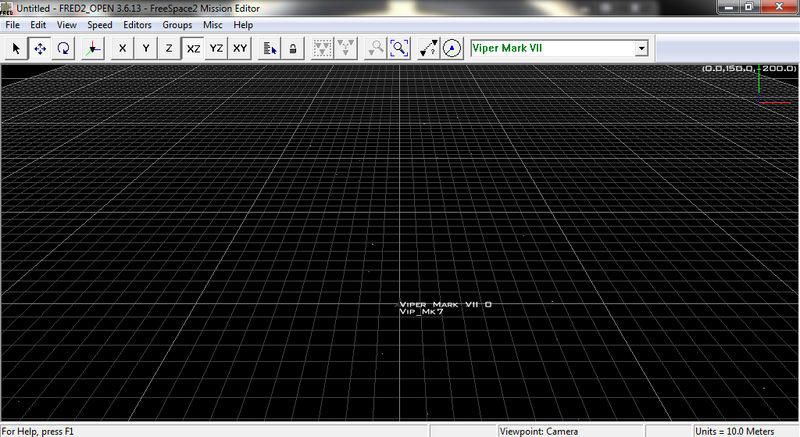 If you only see a wireframe model of the Viper go to the View Menu and select View Ship Models. FRED automatically places a ship when it starts up, as there must always be at least one player ship in every mission. For reasons that will be explained in the full walkthrough, the player needs to be in a ship that is in Alpha wing. To do this you need to select both Vipers. Either drag a box around them with the mouse or select one Viper, hold the SHIFT key and select the other. 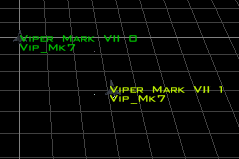 Once you have selected both vipers, you will see that their names have changed colour. This is the Form Wing button. When pressed, it will stick all the selected ships into a wing. Press it and a new window will open, asking you for the name of a wing. 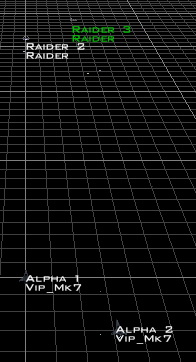 Type Alpha and press OK. You'll notice that the names of the two ships have now changed to Alpha 1 and Alpha 2. We've now dealt with the friendly craft, but what about something for them to fight against? Time to add a couple of Cylons to the mission. On the right side of the Toolbar is a drop down menu containing a list of ships. The box currently says "Colonial Viper Mk VII". Change this to say Cylon Raider, it will be in red, while Colonial ships are green. Hold down CTRL again, and click twice on the map, to place a couple of Cylon raiders a short distance away from the Vipers. The Raiders are in place now but we need to put them in a wing, same as we did with the Vipers. Select both Raiders, click the Form Wing button again, type in Bandit and press OK. You should now be looking at a pair of Raiders called Bandit 1 and Bandit 2. We could simply stop here, but let's make this a little bit more challenging. Let's change the mission so that after these two raiders are killed, two more will jump in. Make sure that the two Raiders are still selected. Then open the Editors Menu and then select Wing Editor (you could also press SHIFT + W). The Wing Editor has a lot of options in it, allowing you to choose when wings of ships appear or what they will do once they are in a mission. For now though, there are only a couple of things we want to change. First change the # of Waves to 2. This means that a second wave of two raiders (Bandit 3 and Bandit 4) will jump in after 1 and 2 are dead. 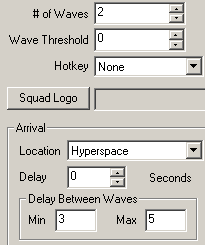 Next change the Delay Between Waves so that the Min is 3 and Max is 5. This inserts a 3 to 5 second delay between the death of Bandit 1 and 2, and the arrival of Bandit 3 and 4. We can now save the mission. It is important that the mission is saved in the correct place. You must save a mission to Diaspora/Data/Missions for the game to find it. By default FRED may try to save it elsewhere. You can change the name from "Untitled" if you want, but there's no real reason to do so. If you do change it, make sure you pick a name that is no more than 26 characters long. When you start Diaspora go to Data Files -> Mission Simulator. Choose Single Missions. You will find your mission listed as Untitled (even if you changed the filename). Have fun killing Cylons in your first ever FRED-created mission!